On Feb. 8, Don Schmid will celebrate his 100th birthday at Mother of Mercy Senior Living Center. He looks back on his life fondly and believes it has been a good one filled with great experiences and memories. Schmid was born in Avon and was one of five children to Edward and Luella Schmid. Of the five, which includes William, Lee, Dorothy, Lois and Schmid, only Lois, 92, and Schmid survive. Schmid has some acquaintance with California. When he left his home in Avon in 1936 at 17 years old, he moved to California for a job opportunity. In November of 1940, he joined the California National Guard. He was 21 at the time and knew he was a prime candidate for the draft. He was called up for duty that month and sent to Camp San Luis Obispo, Calif. He spent two and a half years in the infantry. He may have remained with the infantry had World War II not involved the United States. When the war started, the military needed pilots. When the military decided to allow those who had graduated only from high school to apply to be pilots, he signed up. He passed the tests and in mid-1942, he was in the Army Air Corps (it was not until after WWII that there was a U.S. Air Force). Schmid completed his primary training in Hemet, Calif., and basic flight training in Bakersfield, Calif. He completed his training on twin-engine planes at Williams Air Force Base in Chandler, Ariz. He was then placed on a cadre to open Clovis Air Force Base in New Mexico. It was a training ground for B24 crews. 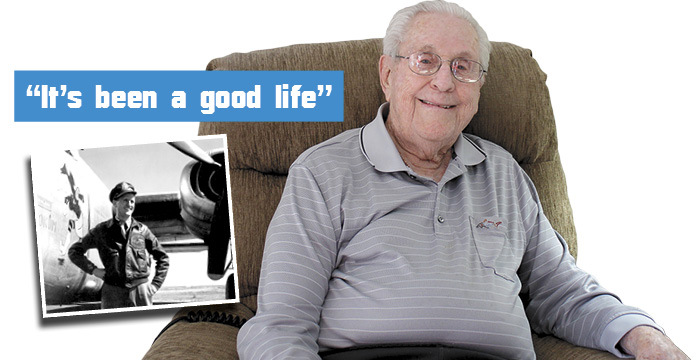 Schmid became a B24 Liberator instructor at Clovis, Langley Field, Va., and Chatham Field, Ga. While at Chatham Field, he asked for and received permission to form a B24 crew and go into combat in Europe. The crew was formed in 1944. The role the B24 played in the war has been under appreciated, according to some. It was a work horse of the U.S. bombing missions in both theatres. There were more of them (B24s) than any other plane as they carried a bigger load, could fly farther, higher and faster. “They were a big weapon in World War II,” Schmid said. The crew flew the plane from New York to Italy stopping at Goose Bay, Canada; Reykjavik, Iceland; Wales, England; Marrakesh, Morocco (Africa); and finally Italy. “Italy was our base for missions during World War II,” he said. The crew flew 27 missions to targets in Czechoslovakia, Austria, northern Italy and Germany. Among their missions were several to Vienna, Austria, and the Ploiesti oilfields in Romania. Their plane was named “The Mammy Yokum” after the character created by Al Capp. Mammy is the head of the Yokum clan in the “Li’l Abner” comic strip. “Therefore, my plane was the lead plane on most of our missions,” Schmid said. The co-pilot was an artist and he painted “Li’l Abner” characters on all the squadron’s planes. The crew returned from its assignment in the 98th Bomb Group in Italy to begin training on B29s at an air force base in Nebraska. That training was terminated because of the eminent end of the war. When the war ended Schmid opted to remain in the military and flew around the world. He was assigned to the Far East, where he flew medical air evacuation missions from Korea to Japan. There were also assignments to bases in Europe and the Caribbean. In 1945 after he came home from Europe, he married Lorraine (Lonnie) Lunde. They had three children. One was born while Schmid was assigned to Coolidge Air Force Base on Antigua in the Caribbean. Two weeks before the baby was born, he flew Lonnie from Antigua to Puerto Rico. Two weeks later, he picked her and the baby up and returned to Antigua. In 1946 the Army Air Corps became the U.S. Air Force. Schmid was in the first cadre of officers for the Air Force. His duties and assignments varied, but he did earn a reputation for being a good pilot. He became the personal pilot for three different generals. One of them clearly believed the rank had its privileges. That general once told Schmid not to fly him straight from Libya to Germany, but to make a detour to Nairobi, Kenya. The general wanted to go hunting. Schmid remained in the military until 1964 when he retired as a lieutenant colonel. He then became the director of customer service for the American Express Credit Card Division in New York. The job put him in touch with people from all walks of life. Some celebrities wanted an American Express credit card. Arrangements were made for them to come to Schmid’s office in New York City to pick up their American Express card. In 1981 Schmid retired from American Express and decided to come back to Minnesota. The allure of the local area had never left him. When he was younger, Schmid often went fishing using his grandfather’s boat. He learned to troll for fish even though the boat did not have a motor. Schmid would row the boat fast enough to keep the spinner up; then throw the line into the water. He once caught a big fish doing that. “I caught a 16-pound Northern, but lost the skin on my big toe because that’s where the line was tied,” he said. Schmid and Lonnie settled in Avon. He remained when Lonnie passed away in 2001 and later moved to the Mother of Mercy Senior Living Home in Albany. In 2015, Schmid served as a grand marshal of the Albany Heritage Days parade. That certificate, as well as photographs and drawings of his family, military career and people he admires hang on the walls of his room. He smiled as he looked out the window.